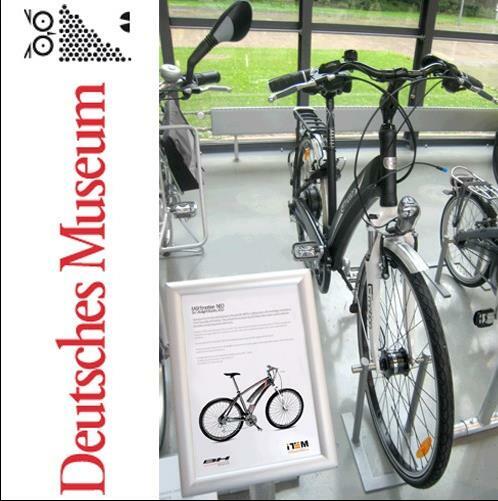 The family of E-bikes NEO designed by ITEM DESARROLLO DE PRODUCTO for BH BIKES was honored in 2011 with an EUROBIKE DESIGN AWARD. Now in 2012 the Deutsches Museum has selected the NEO CITY model for inclusion in its permanent collection. The Deutsches Museum in Munich is the world’s largest Science and Technology museum, with over 1.5 million visitors a year. The NEO CITY joins the museum’s permanent collection in Hall 1, dedicated to urban transport. In this hall are many of the most recognizable models of the most prestigious brands of car manufacturers and European motorcycles. The exhibition is a journey through the most innovative of the individual and collective motor transport, along its most important historical landmarks. The e-bikes are an innovative proposal as an alternative to sustainable personal transport in the urban environment, with an acceptance and market growth unstoppable.